Little Lagoon is separated from the Gulf of Mexico by a little strip of land known as West Beach in Gulf Shores, Alabama. The southern shore of Little Lagoon is lined with both houses and beautiful condominiums that offers spectacular views of the lagoon and, in some cases, the Gulf of Mexico to the south. To the east of Little Lagoon is Gulf State Park, making this a popular area for nature lovers who want to stay in a comfortable condo while they explore the state park, go fishing in the lagoon, and swimming in the Gulf of Mexico, all within easy walking or biking distance. Although the condominiums that sit right on Little Lagoon are not directly on the beach, only a couple hundred yards separate Little Lagoon and the Gulf of Mexico. Many of these lagoon-front condominiums, such as Bel Sole, enjoy deeded beach access which gives guests the same private beach space that they can expect from the Gulf-front condos. Some condominiums have an advantage over Gulf-front condos in onsite boat slips, like those at Lagoon Tower. Many lagoon-front condos, including Mustique and Lagoon Run, also have private fishing piers with gazebos where guests can spend the day fishing in the shade before heading back to grill up their catch for dinner. What these condo developments lack in direct beach access, they make up for in additional amenities and breathtaking views of one of Gulf Shores' most scenic bodies of water. 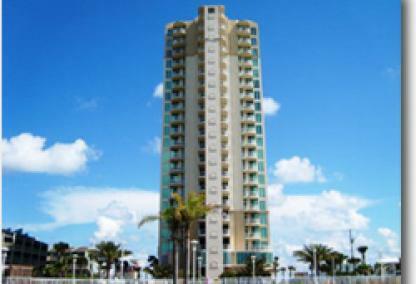 ReadBel Sole condominium is located in the popular West Beach area of Gulf Shores, Alabama. The condo is one mile west of Little Lagoon Bridge and was completed in 2008. Bel Sole is comprised of 49 individual three- and four-bedroom condo units. The condos range in size from 1,539 square feet to over 2,700 square feet. The amenities at Bel Sole include deeded beach access, an exercise room, indoor heated pool, outdoor pool, spa/hot tub, and a fishing pier with marina and shore power. 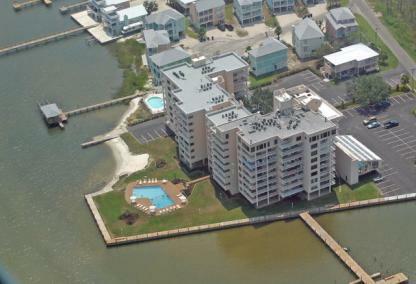 ReadCompass Point condos are located on Little Lagoon in the popular West Beach area of Gulf Shores. Built in 1985, Compass Point features 70 lagoon front units with one to three bedroom floor plans ranging from 728 square feet to 1,290 square feet. Amenities including an outdoor/indoor pool, exercise room, grilling area, boat ramp and dock. ReadGulf Shores Surf & Racquet Club condominium complex is on the north side of Beach Blvd in West Beach and has deeded beach access. This condo development has a great amenity package featuring an outdoor pool, hot tub, tennis and shuffleboard courts, fishing pier, boat slips and boat launch. The 179 units that make up the resort offer Gulf of Mexico views and views of Little Lagoon. Floor plans in this condominium range from around 500 to 800 square feet and are either one or two bedroom units. 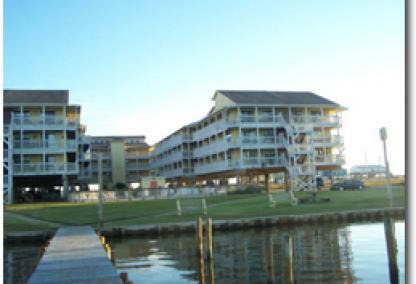 ReadLagoon Run condominium is the second complex past the West Pass Bridge (Callaway Pass) in the West Beach area of Gulf Shores. Built in 1985, the complex consists of 42 condos and offers two and three bedroom units ranging in size from 800 sq. ft to apprx. 1600 sq. ft. Located directly on Little Lagoon, the development boasts an outdoor pool, boat launch, and fishing pier with slips. Lagoon Run is minutes from downtown and close to other area attractions. 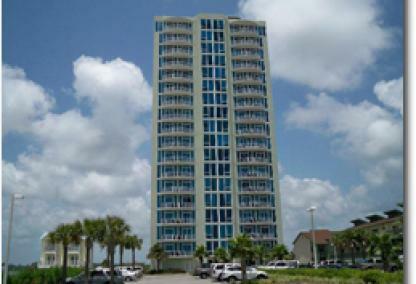 ReadBuilt in 2005, Lagoon Tower sits directly on Little Lagoon in the West Beach area of Gulf Shores. The luxury low-density complex only has 32 units (2 per floor) and offers expansive views. Lagoon Tower offers 3, 4, & 5 bedroom units ranging from approximately 1,800 to 3,700 sq. ft. with deeded beach access just across the street. Property amenities include outdoor/heated indoor pools, hot tub, & high-speed elevator. The condo also has a fishing pier with first come, first serve boat slips. ReadLaguna Sands is a private lagoon-front community at the West Beach side of Gulf Shores. The development is made up of four duplex residences all set directly on Little Lagoon. Residents and guests can enjoy the waterfront pool & sundeck and fishing pier. The beaches are directly across the street with a public beach access is nearby. Restaurants, Gulf Place, and The Hangout is just a short drive away. 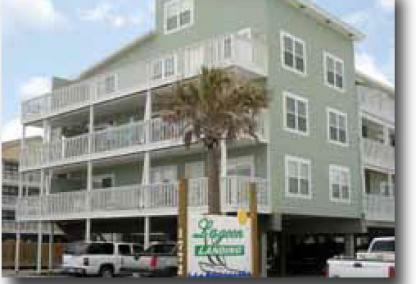 ReadLas Palmas is located in the West Beach area of Gulf Shores near the Pier 33 convenient/grocery store. Las Palmas is comprised of 52 individual condos built in 1984. The floor plans are 750 square foot two-bedroom condos. Amenities for Las Palmas include an outdoor pool and a BBQ area. The complex is less than a mile from the Gulf Shores Hangout and public beaches. ReadMustique condominium is one of a small handful of towers that offer great views of the Gulf of Mexico and have a fishing pier with boating facilities. 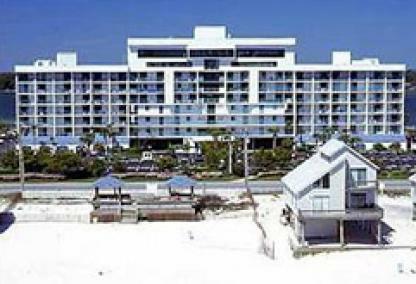 The condos are located in the West Beach area of Gulf Shores Alabama. Mustique condo is a low-density complex and consists of only 38 units and was built in 2007. ReadSea Oats is an older condo development spanning 7 acres along Little Lagoon. 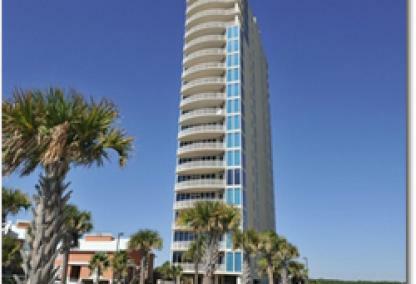 These condos are highly popular among families looking to vacation in Gulf Shores at a bargain cost. Units are either 2 or 3 bedroom floors plans with most providing views of the lagoon or pools. The property features 2 outdoor pools, boat launch, pier with boat slips, grilling area, covered parking, and deeded beach access. 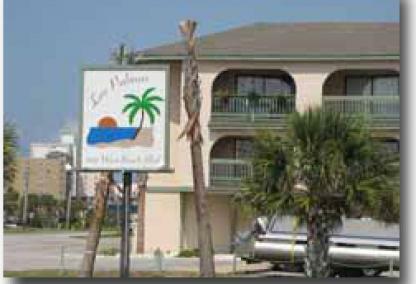 Sea Oats offers great sunset views over the lagoon and is a short drive to central Gulf Shores. ReadSeasons by the Sea is made up of three duplexes set along Little Lagoon on West Beach. These 3 bedroom/ 2.5 bath condos offer spacious floor plans, large kitchens, and great views of the Gulf of Mexico and lagoon. The development is walking distance to Pier 33 convenience store and popular beachside restaurant Bahama Bobs. A community pool and private boat launch are provided by this low-density property. Seasons by the Sea is approximately 1 mile west of Gulf Place and downtown attractions. ReadBuilt in 1984, Summer House West is a 32-unit wooden-framed complex overlooking Little Lagoon. The development offers 1BR/1.5BA & 2BR/2.5BA condos with direct and indirect views of the lagoon. Residents have deeded access to the beach just a short walk across the street. Property amenities include an outdoor pool, gazebo, fishing pier, boat ramp, and a private sandy beach along the lagoon. 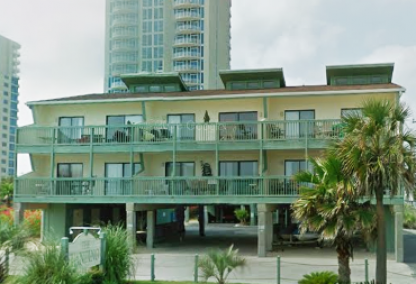 Summer House West is a short drive to restaurants and attractions in the heart of Gulf Shores. 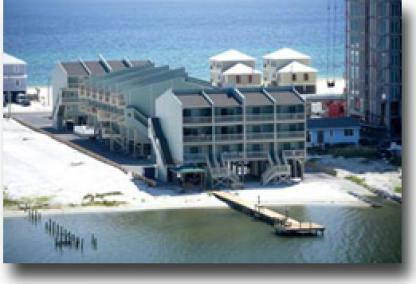 ReadThe Landing condos are located in the West Beach area of Gulf Shores, just past the West Pass bridge. 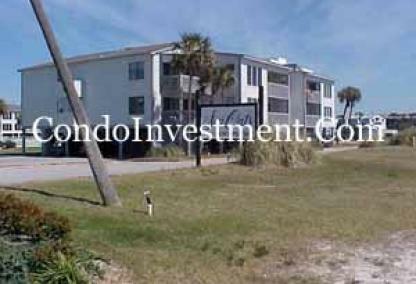 The condos are approximately 3.5 miles West of the public beaches and the Gulf Shores Hangout. A variety of restaurants and shopping centers are within a short distance of The Landing.